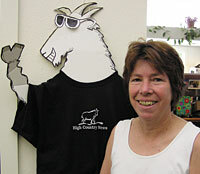 On Aug. 31, HCN's circulation manager, Gretchen Nicholoff, stepped down from her post after nearly two decades of service. Throughout her time at HCN, Gretchen has been a staunch advocate for HCN's subscribers and a "keeper of the flame" that founder Tom Bell brought to the publication 37 years ago. In addition to her many duties as circulation manager - overseeing customer service, making sure that HCN subscribers get their issues, and finding and welcoming new subscribers - Gretchen has provided a wonderful bridge between the eras of Ed and Betsy Marston (1984-2001) and Paul Larmer (2002-present). When asked what she will miss most about working at HCN, Gretchen says, "My terrific staff and the incredibly generous and thoughtful readers of HCN that have made this job meaningful." The staff and board will miss Gretchen's dedication, her smarts and her sense of humor, and wish her all the best in the future. Ford and Margaret Robbins stopped by en route to nearby Glenwood Springs from their home in Santa Fe to visit some of Margaret's childhood friends. Ford, a freelance landscape photographer, was also looking forward to some shooting. Public-lands activist Robert G. Funkhouser died Aug. 10 at the age of 50, from a massive heart attack. He was born July 3, 1957, in Berkeley, Calif., worked as a commercial fisherman and craftsman, and later moved to Norwood, Colo. For the last six years, he served as president of the Western Slope No-Fee Coalition. The group's new president, Kitty Benzar, writes, "Rob was a tireless advocate of free access to public lands for everyone. He worked the phones, networked among diverse groups, met with elected officials and their staffs, spent endless hours in research, testified in Congress and before many state and county elected bodies, and authored dozens of articles, opinion columns, and policy papers, all toward the goal of rolling back, first Fee Demo, and later the Federal Lands Recreation Enhancement." Donations can be sent to The Western Slope No-Fee Coalition, P.O. Box 135, Durango, CO 81301 or to any charity. In our Aug. 6 cover story, "Guns R Us," Washington State University professor Joan Burbick's first name was mistakenly given as "Jean." We apologize for the error.